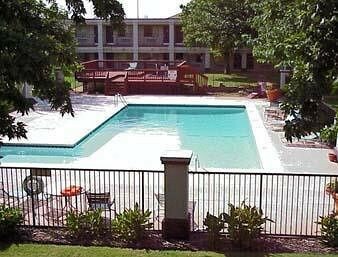 Property Location Located in Oklahoma City, Magnuson Hotel Oklahoma City South is minutes from Crossroads Shopping Center and McCracker Park. This hotel is within close proximity of Lightning Creek Park and Trosper Park Golf Course.Rooms Make yourself at home in one of the 105 air-conditioned rooms featuring microwaves. Complimentary wireless Internet access keeps you connected, and cable programming is available for your entertainment. Conveniences include desks and coffee/tea makers, and you can also request cribs/infant beds (surcharge).Rec, Spa, Premium Amenities Enjoy recreational amenities such as a fitness center and a seasonal outdoor pool.Dining Enjoy a satisfying meal at a restaurant serving guests of Magnuson Hotel Oklahoma City South. Quench your thirst with your favorite drink at a bar/lounge.Business, Other Amenities Featured amenities include express check-in, express check-out, and complimentary newspapers in the lobby. Event facilities at this hotel consist of conference space and meeting rooms. For a surcharge, guests may use a roundtrip airport shuttle during limited hours and a train station pick-up service.